Google has incorporated Morse code into Gboard for Android and iOS Did Google Make the Best iPhone Keyboard Yet? Meet Gboard Did Google Make the Best iPhone Keyboard Yet? Meet Gboard Google recently launched a new keyboard for iPhones called Gboard, and it's exclusively available on iOS right now. It's also probably the best mobile keyboard you have ever used. Read More . This is an attempt to help people with limited mobility communicate using their smartphones. However, Morse code is something everyone should learn in case they ever need to use it. Morse code was developed in the 1800s to enable the sending of messages by way of electrical telegraphs. Its simplicity makes Morse code one of the most versatile forms of communication around, and it has been used in countless ways over the years. The latest use for Morse code is as an assistive technology. Morse code consists of a series of dots and dashes which are then converted into letters. Which makes it perfect for people with disabilities, who can find themselves locked out of modern technology. 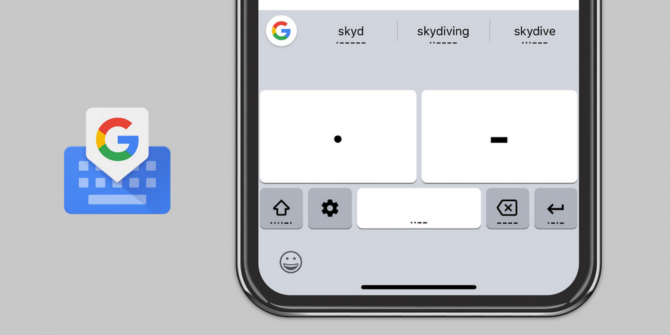 Google is now offering Morse code as an input method in Gboard, its keyboard app. The company has partnered with Tania Finlayson, an expert in Morse code assistive technology. Finlayson has cerebral palsy, and so knows the value of assistive technology. The Morse code keyboard on Gboard means you can now use dots and dashes instead of the QWERTY keyboard to input text. Gboard will then convert these dots and dashes into words and sentences. You can even connect external switches to your Android. Google has also developed a Morse Typing Training game (available on Android, iOS, and desktop) which the company claims can help you learn Morse code in less than an hour. And that has to be worthwhile, whether or not you have mobility issues. If you’re interested in learning more about accessibility options on modern operating systems, we have previously published guides to Windows 10’s accessibility options A Brief Guide to Windows 10 Accessibility Tools A Brief Guide to Windows 10 Accessibility Tools Whether you struggle with poor vision or want to explore speech control, Windows 10 offers plenty of accessibility tools to help you out. We show you where to find and how to use them. Read More , macOS’s accessibility options A Mac OS X Guide To Accessibility Features A Mac OS X Guide To Accessibility Features Mac OS X has a number of accessibility features built-in which can accommodate the needs of most users. Here’s what they are, and what they do. Read More , and Chrome OS’s accessibility options A Complete Guide to Chromebook's Accessibility Tools and Features A Complete Guide to Chromebook's Accessibility Tools and Features Accessibility features are an essential part of any operating system. How do the Chromebook's accessibility features stack up? Here's all you need to know. Read More . Explore more about: Accessibility, Google, Keyboard.